A Collapsible Section makes a section, or group of fields, collapsible. It is useful when there are several sections in your form and you want them to take up less vertical space. You may use collapsible or standard sections to adjust your form layout or conditionally hide/show a group of fields. Customize the style of your Collapsible Sections by going to 'Formidable' → 'Styles' → 'Section Fields'. Select the 'Collapsible' tab and choose the icons you would like to use for opening and closing your collapsible sections. You may also choose whether to put the icon before or after the section title. If you would like to create a Collapsible Section, click on 'Section' → 'Collapsible' in the Fields Panel (in the right sidebar). If you already have a Section Heading and want to make it collapsible, just select the 'Collapsible' option in the field options. Drag and drop fields into your Section. 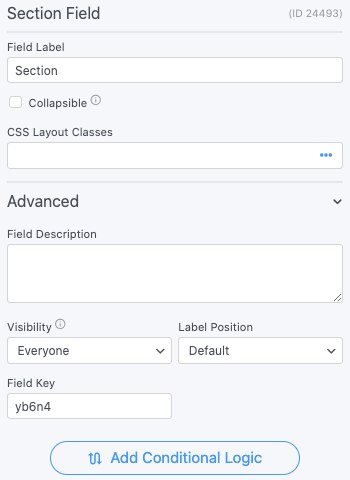 Every field that is in the Section field will be collapsible and will appear when the Section Heading is clicked. If you are using Collapsible Sections and would like only one section to be open at a time, turn it into an accordion by following the steps below. By default, this will make it so the first section is open when the user comes to the form. See an example of an accordion here. Please note: Sections cannot be conditionally hidden/shown when they are in an accordion. Go into edit your form. Open the Field Options for each of your Section Headings and make sure the 'Collapsible' and 'Repeatable' options are NOT checked. Go to 'Settings' → 'Customize HTML'. If you don't like the way it looks, you can change the calendar theme in your 'Formidable' → 'Styles' in the Date Fields tab. The accordion styling will match your selected calendar theme if you have a date field in your form. If you don't want a date field in your form, add a date field and set the Visibility to Administrator.